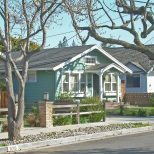 New-build condos aren’t often noted for their charm and character. Behind that sleek glass façade is a collection of blank canvases, just waiting to be reimagined. 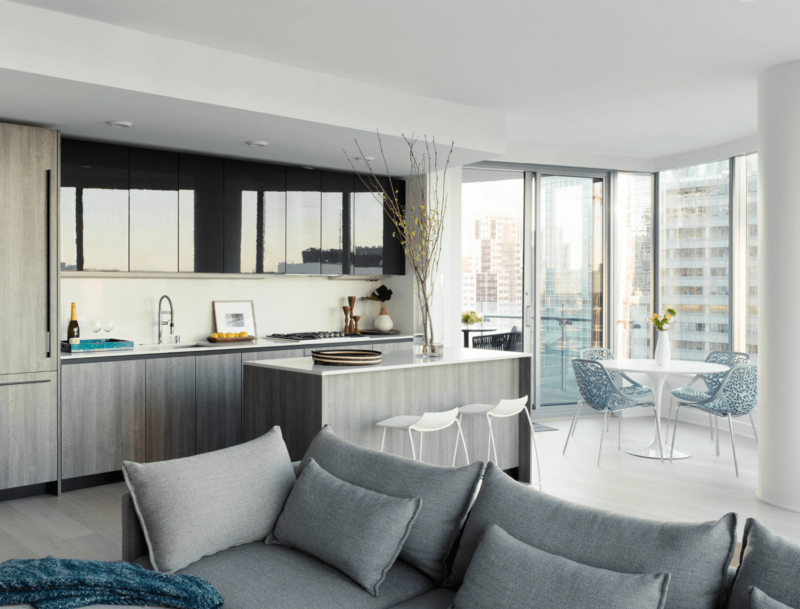 The team of decorators at Décor Aid, an affordable interior design service with fixed fees, was brought on by a busy professional to outfit her West and East Coast apartments simultaneously. 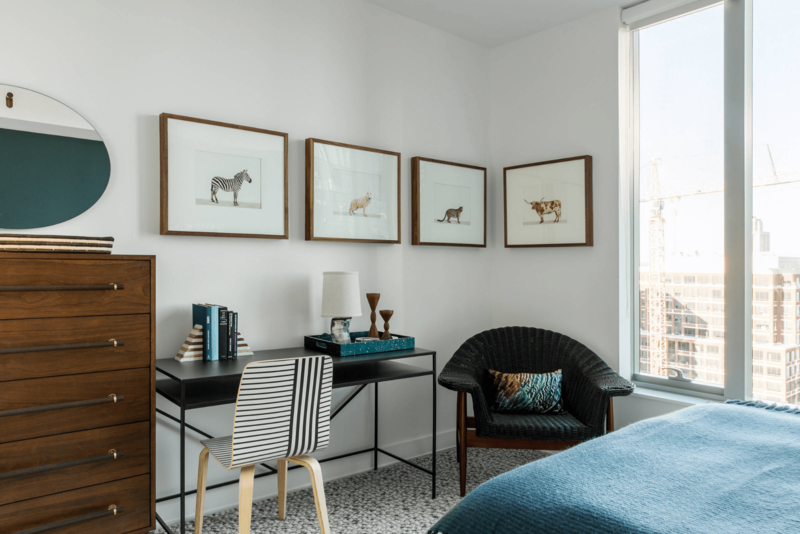 For her pied-à-terre in downtown San Francisco, Décor Aid sought to create a timeless aesthetic, rife with calming colors, striking patterns and clever design tricks. The living area is anchored by four large painted canvases, a budget-friendly fix to disguise the television. “Those canvases also lend the space a grand feature full of subtle personality that no bare wall could evoke,” adds Juneja. A plush gray sectional beckons at the end of a long day, cozied up with knit blankets, patterned throw pillows and a faded area rug underfoot. 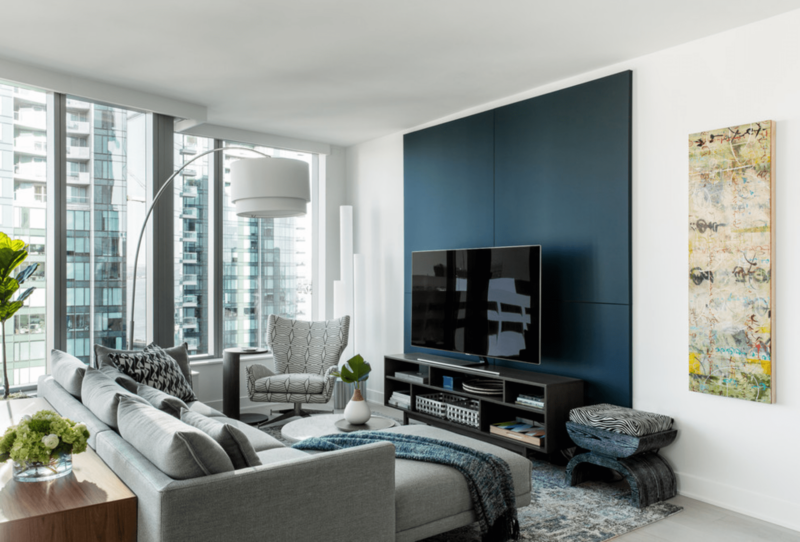 “Nothing beats a minimal gray sofa in a commonly used space since they’ll always look current and will help to hide everyday wear and tear and spills without constant cleaning,” says Juneja. 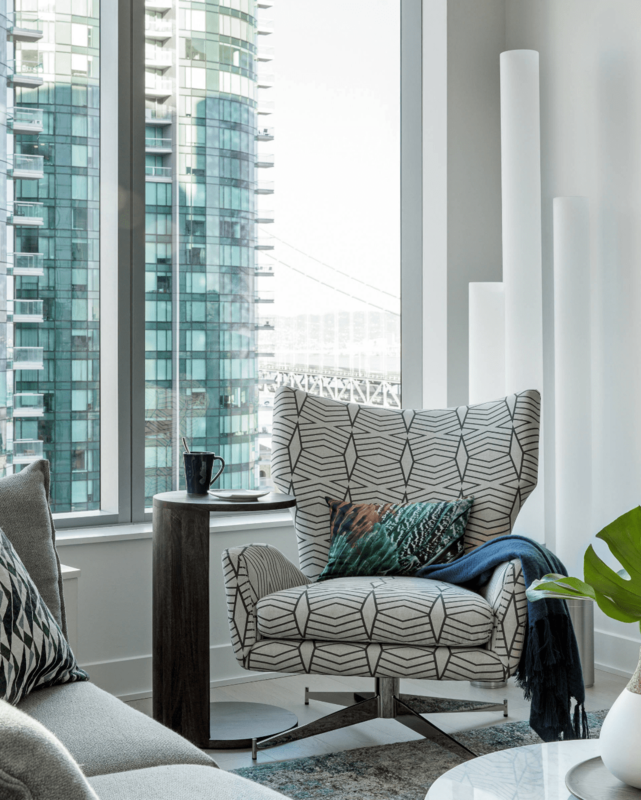 A geometric-patterned swivel chair provides extra seating when needed and a sculptural stool covered in a zebra-print fabric serves as a playful addition to the space. Chrome accessories and greenery are scattered throughout the condo, giving it a cohesive feel. The kitchen and dining area are bathed in natural light that pours in from the surrounding wall of floor-to-ceiling windows. “Lucky for our client, those contrasting reflective upper cabinets are terrific for catching light while moving the eye upwards,” says Juneja. “And since a majority of the space is all-white, those dark cabinets actually worked in our favor as they lend the space needed depth and attitude.” A Saarinen-inspired dining table is paired with the Miss Lacy armchairs by French designer Philippe Starck, which, as their name implies, resemble baroque lace. What the master bedroom lacks in space, it sure makes up for in style. 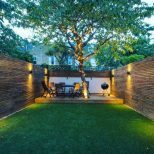 “Since this isn’t a permanent residence, but it’s also a place to unwind when needed, we wanted to inject more design flourishes to keep the area as warm and comforting as possible, while keeping it light and approachable in feel,” says Juneja. 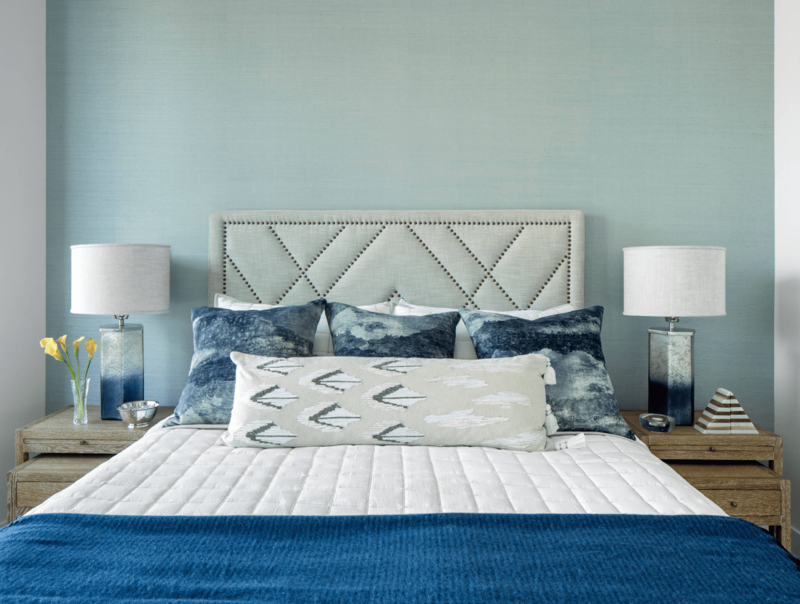 Texture is amplified through the studded and paneled headboard, sisal wallpaper and layered ben linens. 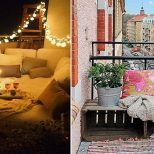 “In fact, when you look at the bedroom, almost every feature boasts plenty of texture, but since the colors are classic and calming, nothing appears heavy-handed or over the top,” he insists. 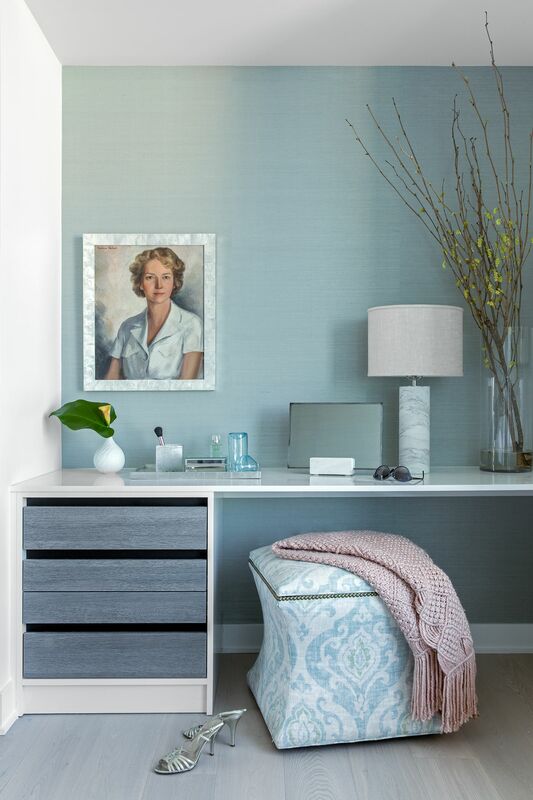 The built-in vanity was designed to “mimic the kitchen cabinet fronts” with a white lacquer finish and blue-gray pull-out drawers for added storage. “This way, the feature would work as a bonus if our client was ever looking to resell this space,” explains Juneja. 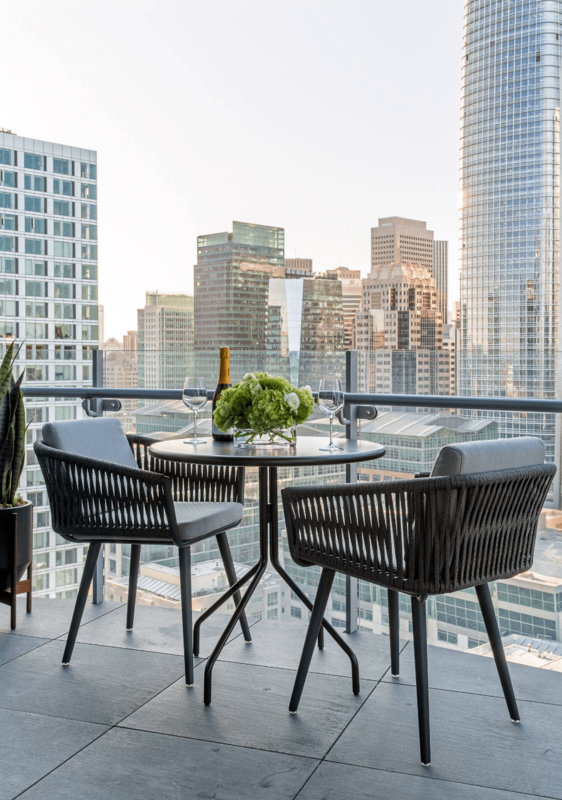 And because no city escape would be complete without a skyline view, there’s a small balcony with a modern bistro set and towering snake plant. When asked to describe the project in one word, Jungeja lands on ‘timeless.’ “I can’t imagine any aspect of it feeling tired or dated any time soon,” he muses.